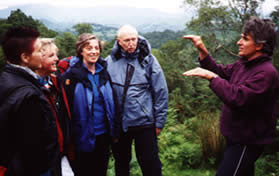 Join a group of singers walking for three days from Castlerigg Stone circle near Keswick to Coniston, via Derwent Water, Catbells, Borrowdale, the Old Dungeon Ghyll hotel and the Langdale valley, Loughrigg Tarn, Little Langdale, Cathedral Cavern, Tarn Howes, and Coniston Water. We will be staying in three different camp sites along the way situated in stunning locations - those who enjoy wild swimming will have plenty of opportunities in rivers, lakes and under waterfalls. Those who book early may also be able to book local B&B if they prefer - we will provide addresses close to where we will be camping. All the heavy bags will be carried by our support vehicle and meals will be provided at the camps. All you will need to carry with you is a day rucksack with waterproofs, sandwiches and a flask - and a torch. There will be concerts along the way with singing from ourselves and from local singers who will meet us - as well as many informal opportunities to sing outside in the hills, in vast Lakeland caverns, beside waterfalls - and around the fires of country pubs. In the event of bad weather we will make adjustments to our route - there will be many opportunities for shelter and refreshment along the way. Cost is £95 including food and camp fees. To book - a deposit of £50 will secure your place. Booking Conditions: The £50 deposit is refundable until January 1 2011 - after which we reserve the right to keep it. The remainder will need to be paid by February 1 (which is also refundable minus the deposit until March 1 after which we reserve the right to keep the full ammount.) All places are fully transferrable - ie you may find someone else to take your place as long as they are fully informed and prepared for joining us. We did everything we planned to and much more. Sang in the Little Langdale cave, walked through the Langdale valley and over to Wast Water, and then Buttermere, Borrowdale and Easedale. Did our concerts in all the little chapels and pubs and ending on the terraces of Lancrigg Hotel. Camped by mountain streams and under rocky crags. The shared repertoire worked better than I had hoped (I sent out the music in advance along with a learning tape for those who learnt by ear). Our first singing was by the Colwith Waterfalls where we sang Plovi Barko and Tebe Poem (after a warm up in the woods and a few rounds) which worked wonderfully. We sang Nkosi Sikelel 'iAfrica on top of Esk Hause with extraordinary views over Borrowdale, Langdale and Scafell. Performed Unison in Harmony and Go Go Shavtala on the verdant terraces of Lancrigg Vegetarian Hotel after a couple of run throughs coming down Far Easedale. And our concert on Sunday in Stonethwaite went like a dream - you could imagine we'd been practicing for months rather than just the weekend we were walking together. I think what I liked most was how soon we became a community - where everyone helped each other, like the singing made people more aware of each other's needs. I also liked the way we were like a flock of birds where we would turn up somewhere to sing and everyone would be all excited going in all different directions and talking and seemingly completely anarchic. Then we'd start to sing and everyone was completely together as one unit, going in one direction. It reminded me a bit of how choirs on tour behave - like Northern Harmony and Solidarity - when they visit. That sense of chaos, and then they'd all come together in a circle (which we did as well on many occasions to remind us of our purpose and to let everyone say what they needed to - as well as to hear the harmonies clearly!). I learned that there are many things which you take for granted when you do a workshop in a hall which you have to create when you're out in the mountains. Like the focus you get when there are four walls around you, can be recreated by getting everyone into a cirlce by a waterfall, or in a cave, or in a sheltered spot behind a crag on the mountain passes. I like to think that all this returning to nature - swimiming in mountain tarns and under waterfalls, camping with the sounds of woodpeckers and cuckoos in the morning, seeing the mountains by moonlight and the clouds peeling back to let us pass in sunlight - all that nature connected us to our natural voices. If nothing else, our lungs were expanded, our bodies connected and our hearts fired up! Some songs were easy to teach. 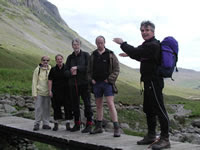 I taught Ali Burns' And a Mountain ("when it is no longer a mountain, goes back to the sea") on top of Greenup Edge. To remind them of the words, I mimed a mountain with my hands and the sea with a wave motion - before I realised it was easier to just point to Bowfell behind me and the Irish Sea beyond Wasdale. We sang Tarry Wool at the Black Sail Youth Hostel, and Dolly the tame sheep who the warden feeds with biscuits, came and hassled us for food. Breege slipped and hurt her hand - so she lay on the grass and we sat around her and sang the Georgian healing song Batonebo. I have to confess I was doing it somewhat ironically, pretending we were mountain healers - but it worked. She stood up healed! Afterwards we saw the mountain rescue team air lifting someone off the mountain who'd broken a leg. We wanted to go up to them and say "Stand to one side, we're singers." And then sing Batonebo round the injured body. You can imagine it at the scene of car crashes, people screaming, blood pouring out in rivers, and someone leaning over the body turning to the crowd: "Is anyone here a harmony singer?". Our group of 14 certainly sang a lot. Walking up a hill, we'd stop to let the ones at the back catch up and start a song, teaching the last part to the ones who arrived on the crag last. But also most people seemed to sing as they walked. 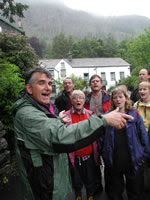 Especially Geoff and Zaka who kept up a Georgian serenade right through the Langdale valley. David Stewart from the Silsden singers said that there'd been research which showed that when you sing your body floods with the natural painkillers and mood enhancers called endorphins. So the singing eased off all the pains which might have arisen from blisters and tired muscles. The Hills were alive with our singing - and continued to echo with our songs till we sang here again the following year - May 27-30 2005 - at the Black Sail Pass Youth Hostel. And the year after that along the Dales Way from Sedbergh to Ilkley. 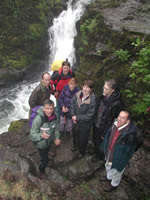 And in 2007 through the Howgill Hills, in then in 2008 and 2009 in Sedbergh. 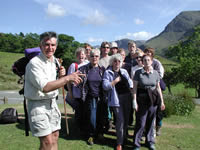 Join us in 2011 for what we hope will be the most magnificent of our walks!